← Did Serena’s Meltdown Actually Help Tennis? Review – Andre Agassi’s “Open”. For all the continued talk over Andre Agassi’s recent admission that he took crystal meth in 1997, after reading “Open”, one can understand how that life error could occur. 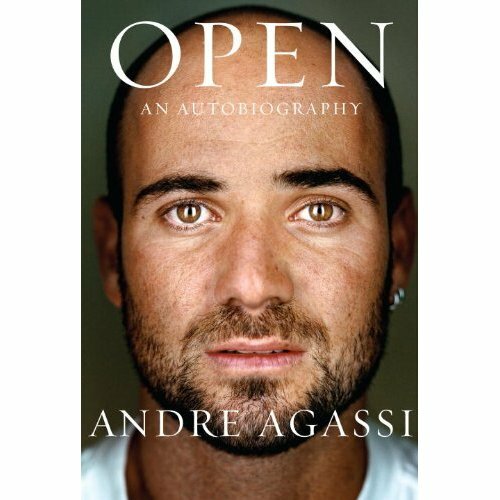 It doesn’t condone what happened or how it was covered up, both by Agassi and the ATP, but after reading the book, one realizes there is so much more to the man than that dark period in his life. Agassi’s story is a roller coaster ride from the very beginning. Basically forced into tennis by his overdemanding Armenian/Iranian father, Agassi recounts spending most of his youth rebelling against his natural talent, then against Nick Bollettieri, the ringmaster impresario entrusted with developing his gifts. Once Agassi is free to play as a pro at the age of 16, basically the only career choice available to him, he finally does so with a mixture of joy at finally being able to earn a living, and a good one, but always with a tinge of regret that he really never chose the sport. Agassi relates with candor his fairytale gone bad marriage to Brooke Shields, his deep friendship with trainer and almost spiritual advisor Gil Reyes and his later courtship and marriage to Steffi Graf. If one hopes to find “bitter gossip” about Agassi’s love affairs, you won’t find it here as even his most painful moments regarding Shields are written in a sad yet guarded tone. Agassi’s frank talk about life on the tour back in the 90’s reminds the reader that it was still a bit of circus, where players could avoid Grand Slams based on “not feeling like it” and cherry pick events in the hopes of avoiding certain players or surfaces to protect ranking points. Agassi was one of those players who floated in and out of the tennis world, winning big and then losing big. It’s probably a miracle that such inconsistency yielded major wins, Wimbledon and his first U.S. Open, at such improbable times. The writing is superb and mention must be given to Agassi’s collaborator J.R. Moehringer who allowed Agassi’s voice to emerge with such vivid clarity. Probably why Agassi’s book is having so much impact is that Agassi really did transcend the game into public consciousness. Pete Sampras may have more Grand Slam titles, but Agassi will be the one long remembered for his style and personality which, as we are now finding out, was more of a reaction to his life than a reflection of it. Even he admits the whole “image is everything” line was forced on him by hungry ad execs. If Agassi’s new image as humanitarian and revered veteran gets tarnished by his honest admissions is still unknown. The book is a journey and after finishing it, one gets that sense that Agassi’s is just beginning. My recommendation – A definite buy and/or holiday gift request. (Special Thanks to Knopf for providing me the book). Comments Off on Review – Andre Agassi’s “Open”.